These climbers are equipped with dowel and screw style replaceable gaffs set in a steel contoured straight shanks. Equipped with the 2-1/2" tree gaff. 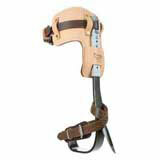 Complete climbers set with deluxe "L" pads, 22" nylon leg straps and two part nylon foot straps. If you wish to create a custom climber set order the SB93089 Climber without pads and upper straps and choose your favorite pads and top straps from our large selection of premium pads and straps.